Found this little gem on Pinterest. It was marketed as a fall craft, but I added the leaf just to do another color. Draw a leaf and a pumpkin on two separate baggies. 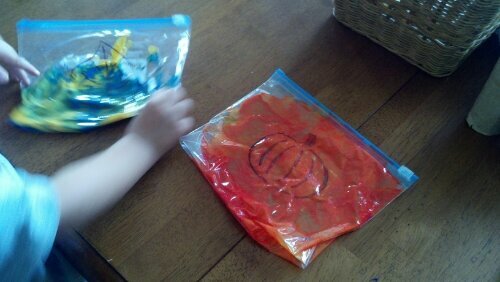 Squirt red and orange paint in the pumpkin bag and blue and yellow paint in the leaf bag. Squish and squeeze! I found I needed to add more yellow to each bag to get the orange and green to show up. 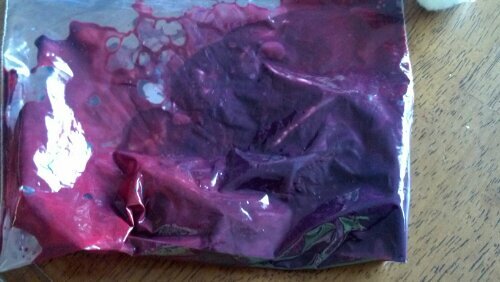 Joe really enjoyed squirting the paint in the baggies…which made me very nervous. I was imagining a paint splattered kitchen and we’ve already passed kitchen cleaning day for the week so of course we could not possibly clean it up until next Thursday. He also liked squishing the bags. 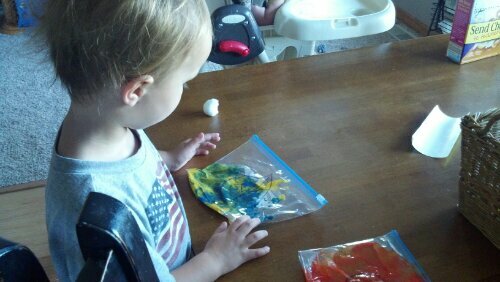 He wanted to make purple so I drew a bunch of grapes on another bag and he squirted red and blue in and squished away. You can’t see the grapes of course, all that paint is hiding my masterpiece, but trust me, they are there. He went on to tell me a story about the leaf and a bee that had landed on it before he completely lost interest and wanted to go outside. It was fun, even though it only lasted a few minutes.